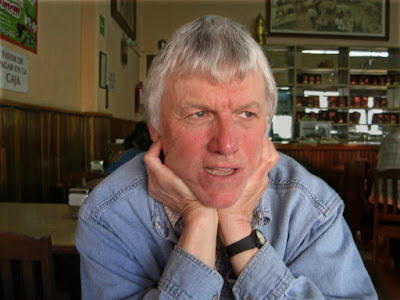 Photo Ranch: Jim Alford at La Habana Cafe, Mexico City. Un amigo from "La Casa de Los Amigos" (Quaker House). Jim Alford at La Habana Cafe, Mexico City. Un amigo from "La Casa de Los Amigos" (Quaker House). JIM ALFORD...I JUST CLICKED ONTO THIS PAGE ..AND GUESS WHAT THERE IS A PHOTO OF YOU MY FRIEND....I LIVE IN FRISCO TEXAS AND HAVE FOR 2 YRS...I BOUGHT A HOUSE HERE...COLLEEN PASSED AWAY ON THE 22ND OF DEC..SO MUCH SADNESS..SHE HAD A SIMPLE THUMB SURGERY ON THE 6TH AND IN ICU ON THE 7TH AND FOR THE NEXT 15 DAYS...EVEN WITH MODERN MEDICINE THE COMPLICATIONS JUST KEPT APPEARING..